We’ve raised $16,000 out of our $50,000 goal! The Quality Hooch Campaign prepares for year four of ensuring a forever clean and sustainable Chattahoochee River. The 2019 campaign will continue the partnership with our friends from Orvis to help us raise $50,000 to support our water quality monitoring programs including CASSi, BacteriAlert, Neighborhood Water Watch and river cleanups in the Chattahoochee River National Recreation Area (CRNRA). The 2019 campaign will continue our partnership with your friends from SweetWater Brewing Company and BOTE Board to help us raise $50,000 to support our monitoring, CASSi, BacteriAlert and cleanup programs in the Chattahoochee River National Recreation Area (CRNRA). 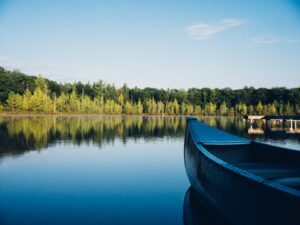 The Orvis Company, which has two locations in the Metro Atlanta area – Buckhead and Alpharetta – has a long history of environmental stewardship dedicating 5% of pre-tax profits each year to conservation. 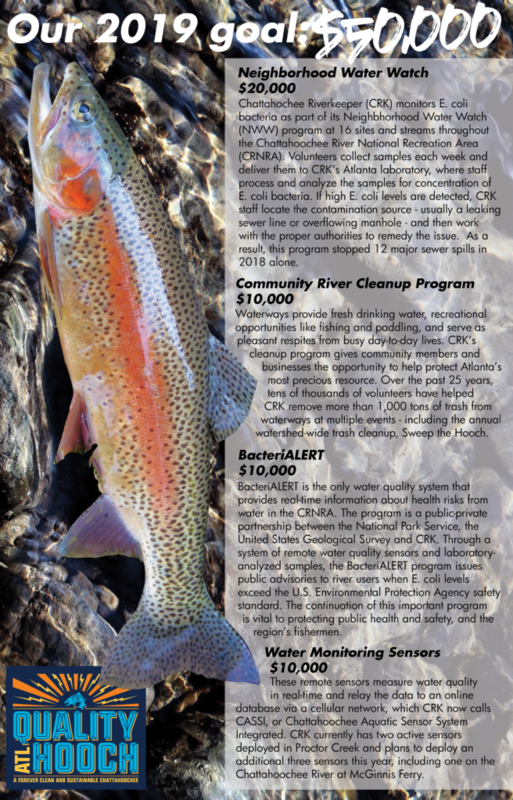 During our five year partnership, Orvis has helped raise over $60,000 for our water quality program work. We look forward to continuing our partnership in our 25th year of keeping watch over the Chattahoochee, and working together to ensure our thriving trout fishery stays sustainable and protected. Chattahoochee Riverkeeper, along with our friends from The Orvis Company and Sweetwater Brewing Company, will host a fun night of good food, heady brews, fresh films, and a silent auction on September 29, 2019 at The Metropolitan Club in Alpharetta. 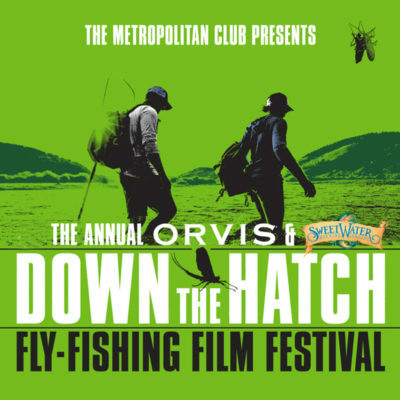 This will be the 6th Annual Orvis Down the Hatch Fly Fishing Film Festival and it will be a night you don’t want to miss! So mark your calendars and stay tuned to the event page for more details! This year, all Orvis FF101, 201, and 301 students will receive a one-year membership to CRK. Visit Atlanta or Alpharetta to view their calendars and register for a class! Thanks to all who joined us for the 4th Annual Quality Hooch kick-off party in celebration of Orvis Spring Days. The event featured food, SweetWater beer, celebrity guest speakers, and some great deals on apparel. With your help, we were able to raise $500 – enough to fund 1 CASSi water sensor! Join us from 3-5 p.m. at Orvis Atlanta to view the submissions for this year’s film competition! Guests will vote on the six best films which will be shown at this year’s Down the Hatch Film Festival on September 29. Snacks and SweetWater beer provided. Interested in submitting a film? Check out https://chattahoochee.org/dth/down-the-hatch-short-film-competition/ to enter! For the entire month of September, Orvis will be celebrating community and the river that sustains us all. Visit the Atlanta or Alpharetta stores to make a donation to Chattahoochee Riverkeeper and get your name on the window of the shop! Orvis will be matching your donations up to $2,000, and on September 26 will invite you to join them at Orvis Atlanta for a special in-store VIP event. Visit Orvis Atlanta or follow them on Instagram at @orvisatlanta for more details available later this summer.